I was in conversation with my father last week and remembered him taking me to Rufforth a few times around 1971/72, where a business friend of his was racing in Clubmans. I remember him having a Chevron (B1) with most of his competitors racing Mallocks. I think the series was called the Northern Clubmans Championship. Does anyone know what became of him or the car which I believe was quite successful as I remember him being a front runner. Do you mean what became of John Love? Started nine Grands Prix, best place 2nd (South Africa 1967). There were certainly more than one John Love. There was another club racer of that name who raced a Mini in the mid '70s. No, he was from Yorkshire and only a club racer, not the South African you are referring to. In 1972 the championship was the Esso Uniflo Northern Clubmans Championship or simply the Northern Clubmans Championship. I have found 2 programmes from Rufforth, Saturday 27th May 1972 and the Battle of Britain Meeting Sunday 3rd September. The Clubmans races were combined with the Northern Club Modified Sports Car Championship with the latter split into classes for up to 1150cc and over 1150cc. The Clubmans also had 2 classes; for under 1000cc and 1001cc to 1600cc. Interestingly, looking at the Chevron chassis data there were apparently 2 B1's built and in the May race at Rufforth there were 2 B1's, John Love and Geoff Temple. 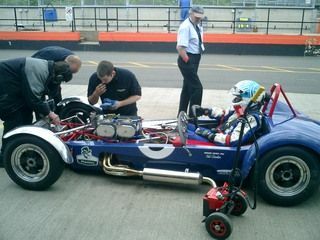 The later race only had John Love in a B1 and he was shown as second in the Northern Clubmans Championship to Alexander G (Sandy) Watson in a Mallock. Confusingly The Esso championship is shown with different points, but still led by Sandy Watson. I assume that there would not have been any other B1's. Was this the same John Love who had a picture frame moulding factory in the Barnsley area? I did some business with him some years ago, and then spotted him wandering around at the Chevron 40th celebrations a couple of years back at Oulton Park. Dear me. Such ignorance. John love was Rhodesian, and bloody proud of it. You've not read the thread properly, Rhodie Racer! Of course, we all know THE John Love, and I for one am full of admiration and respect for him. This is another driver, a Northern British club racer who happened to share the same name, so less of the "such ignorance" if you please, sir! Sorry my long necked friend. I was replying to the almost sacreligious claim that, THE, John Love was South Afircan. That's not unreasonable. It's a bit like calling a Scot an Englishman! No offence intended re: the Rhodesian connection. Getting back to the thread. Were both the B1's raced in the championship? ...and what became of John Love, the Yorkshire clubmans racer? I have a lead on John Love, Mark 13. I'll follow up by phone today, and pick up the thread again tonignt. Hopefully my hunch will prove fruitful! I note that one can now purchase a Chevron B1 MkII for £20,000 quidlets. Would one of the Chevron B1s have been ably piloted by Howard Heerey, who, for a very successful racing driver, did a remarkable impersonation of a librarian - A nicer person you could never wish to meet. I recall Howard Heerey coming into Clubmans with instant success with what I thought was the first B1, but I have since been told that Brian Classic had the first one. Eureka! I've found John Love!!! & it's the chap I've known for years from the picture frame moulding business!!! Via a colleague in the trade, I have tracked him down to a business in Barnsley, Woodside Products. I've confirmed he is indeed the Chevron B1 racer, and that he only sold the car fairly recently! 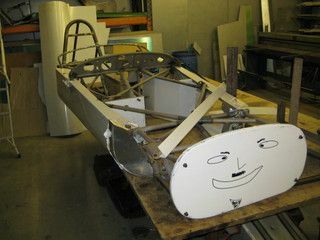 Which chassis this was and to whom he sold it, I will discover on his return from holiday in the South of France, as I now have his home number! ...and this on the day that my pal of 20 years with no interest in motorsport tells me that his cousin is Dave Greenwood, Alonso's chief engineer.... sheesh! Having consulted David Gordon's book, I rather suspect that the clubman's car in question here is one of the four B2's rather than one of the two B1's that seem to be accounted for these days. But which chassis, and whom did he sell it to? I am impatient for John Love's return from the South of France next week to find out, and also to learn more of his exploits! All this talk of early clubmans is bringing on a serious case of sellers remorse over my Coldwell Mink last year! The clubmans stuff starts about 1/2 way through. Is this Kings Lynn Dave Greenwood, the ex-FSV racer? No, David Greenwood was born in Wakefield, West Yorkshire and unsurprisingly, lives in Oxford, as I believe does Alonso himself. Both Chevron B1's were at the 2005 Oulton Park Gold Cup, Chevron's 40th birthday party. One was the works car of Vin Malkie, the original ex-Derek Bennett car, and the other was with Geoff Temple of Morpeth. I rather suspect now that the latter is the John Love car; a chap at Woodside Products told me that John had only recently sold the car, but in the greater scheme of things, 3 or so years is recent, I suppose! 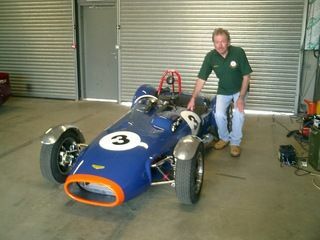 Brian Classick was also at the Oulton meeting in a B2. I should have more news soon as I shall try and contact John tonight or tomorrow. Even worse calling a Yorkshireman Lancastrian! For the record John Love (the foreign one) may have been born in Rhodesia but I think you will find most of his life was spent near Jo burg and he is a RSA citizen, not a bad peddler to boot, he ran against Scheckter( the other one)Duxbury etc, in the early eighties with lesser machinery and displayed a turn of speed. 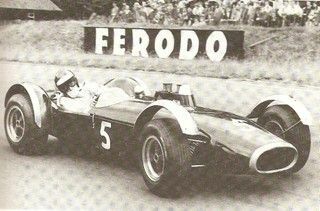 The Rhodi John Love started 9 GP's, & nearly won the '67 South African race, only to run out of fuel while leading in his 2.7 Cooper T75 Climax 4. (he finished 2nd). He won 6 South African championships, and was a great rival of Dave Charlton. I know of a Rodney Dodson, a hotelier in Monmouth; surely not the same chap as rdmotorsport??? Getting back to the Barnsley John Love, Mark 13 tells me that he didn't like to wear seatbelts, and sustained a back injury when thrown out of the car on one occasion! I find it hard to believe I've known the guy for 23 years, done business with him, yet never knew of his Chevron racing pedigree! That was an interesting post at Aintree, as cars that missed the escape road, yet still left the circuit ran into grass considerably higher than most single seaters, clubman's cars etc! Sometimes they took some finding, and you were buggered in there if you heard an engine re-start!!! I have just come off the phone from John Love; he was distantly related to the Rhodie John Love!!! He bought the car, a B2 in actuality from whom he cannot remember in partnership with Barry Joel (whom he later bought out), for £1000! It originally had a 1500 downdraught Holbay in it, which he replaced with a 1600 crossflow. John say's he was offered alot of money for it over the years, largely by people who wanted to turn it into a roadcar, but refused. He sold it in the last year or so to Vin Malkie, "for peanuts" on the understanding that he would restore it as a historical piece. I'm going to visit him soon, as I sense there are many more stories to come from his '65 to '73 career in club racing. 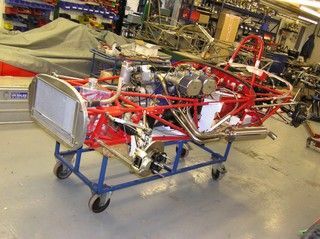 .......John told me he used to buy the front wheels/tyres off RAC British Sports Car champion Trevor Twaites Chevron B8, as they fitted the rear of his B2!!! John had many wins, and reckons he had the class lap record at Croft at one stage. He cites taking a corner off the B2 at the Esso hairpin at Oulton Park, and landing end-up in the ditch at Becher's Brook at Aintree! He also raced a TVR Griffiths "great in a straight line..............", a Lotus 7, and a Lotus 11 during a successful career before marriage curtailed it. He is 70 now. When did he race the Griff? Earlier in his career, mid 60's. Rufforth, Croft, Mallory Park. I think he had a huge V8 in it, 6 litres + of Chevy! He's not a great internet user, and I don't want to pester the life out of him, so I'm saving up questions for him! I hope to "Interview" John Love this week, and will post more in due course, so if anyone wants to be remembered to him, or have any questions for him, please ask. I met up with John Love at Woodside Products in Wombwell, Barnsley today, and apart from swapping yarns about the picture framing industry that we are both associated with, managed to put a bit of meat on the bones, so as to speak! John reckons he started racing in 1965 with a new Lotus 7. He converted it to IRS spec, and replaced the diff initially with one from a Lotus Elite, and subsequently with a stronger MGB diff. After enjoying much success with the car, with an outright win at Cadwell amongst other venues, he part ex-ed it with Jimmy Goddard at Scourton Garage for the ex-Tommy Entwistle TVR Griffiths, a 1966 car. 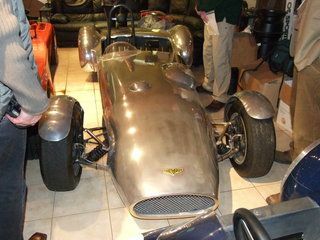 He acquired it in 1968 or 69, and competed with it in the Birkett Relay in a team of TVR's. Next came the infamous Chevron B2 which he purchased in the late 60's in partnership with Barry Joel of Sheffield for the princely sum of £500 each = £1000! He reckons he bought it in Liverpool and it was equipped with a downdraught 1500cc Holbay, producing 120 bhp. With a fluorescent orange nose and trim over dark blue, John reckons it was Howard Heerey's car, or at a pinch Geoff Temple's; any help here please? He says there was no chassis number. 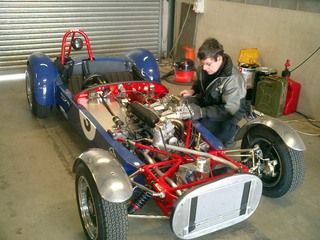 John reckons it was more powerful but not as fast as his Lotus 7 due to it's weight, but handled beautifully. He reckons he last raced it at Rufforth in either 1975 or 76, and mothballed it until selling it in recent times to Vin Malkie, who promised John's grandson a sit in it when it is finally restored! (Attn. Vin!). John also raced a Lotus 11 with a Coventry Climax 1100cc FWA, that was the spare works Le Mans car, with the faired bodywork, and long distance fuel tank (which John changed for expediency). He bought it from a friend of George Duncan, and had some success with it, before selling it to Ian Watling who (against John's advice), drove it back to Scotland on the road, and blew it up en-route! John has entrusted me with with an old b&w snapshot of Barry Joel & himself in John's garage with the B2, which I will attempt to scan and post in the coming days. John lost all of his trophies and photos in a burglary some years back, and asks if any of the race photographers have any record of his exploits between 1965 and 1976, could they let him know via myself. What an era to go club racing in chaps. or is is that just me??? I've been in contact with Helen Bashford-Malkie today, who tells me that Vin bought the B2 unbeknown to her, and decided to surprise her with it! The car arrived with "70's wings and flares" according to Helen, and it is being restored by Vin himself as opposed to in the main Chevron workshop. As you might imagine, a complete photographic record of the rebuild is being recorded, and I will ask if we can have access to this. Chevron believe it to indeed be the Howard Heerey car; does anybody know what has happened to Howard? 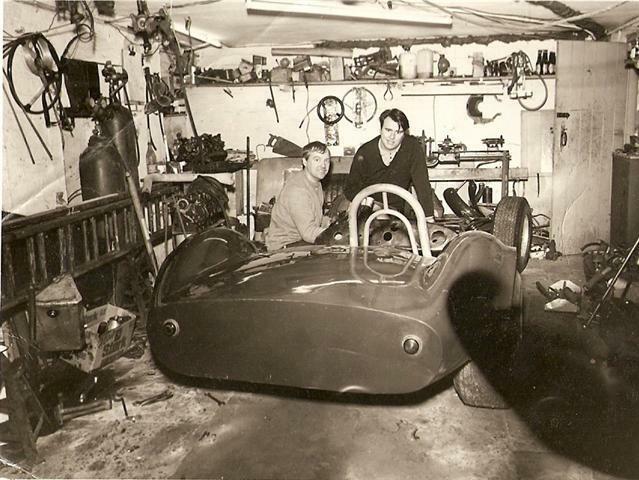 John Love, Barry Joel and the Howard Heerey Chevron B2 in John's garage during "development" post Heerey! TNF'rs of a certain age (with cameras), I need your help on this one. John Love lost all of his trophies, memorabilia and photo's/8mm cine films in a robbery some years ago. Whilst racing predominantly at northern circuits, he did venture as far south as Brands Hatch, (making 2nd on the grid in a clubman's event on one occasion). If anyone has photos of John in his Lotus 7, 11, TVR Griffiths or Chevron B2, can you either post them or contact me? I'm trying to do my good deed for the year! Asking again for anyone who might have photos of John Love from Barnsley racing his Chevron B2 (pictured above), his Lotus 7, Lotus 11 or TVR Griffiths in from the mid 60's to the mid 70's. John was quite successful around the Northern circuits, but did venture south on occasion. John lost all of his trophies and memorabilia in a burglary years ago, so I said I'd see if anyone could help on TNF. And here is the very same ex-Howard Heerey/John Love-Barry Joel B2 looking very pleased with itself at the Chevron workshop as seen on the TNF visit last Thursday evening. 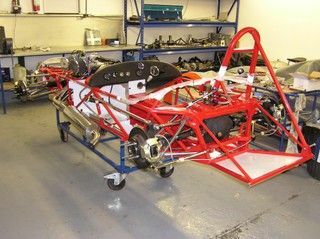 Helen Malkie assures me it is ready for re-assembly and very near to completion now. The Malkies told me that they now have both B1, and two of the four B2 chassis at Chevron, and they know the location of the other two B2 cars. The aim is to re-unite all six cars on-track at this year's Goodwood Revival meeting! And here is one of it's brothers at the Chevron workshop with it's clothes on, pictured last Thursday evening! 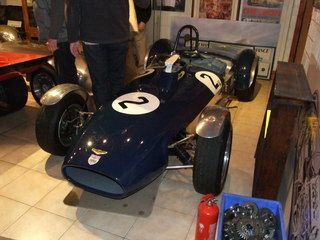 And again pictured at the Chevron workshop last Thursday, the one that got the ball rolling, Derek Bennett's first and original B1. Photo courtesey of Frank Hall and borrowed from "Chevron, the Derek Bennett story" by David Gordon. Howard Heerey on his way to the 1967 Clubmans Championship in the B2 currently being restored at Chevron. I'm trying to keep this thread alive in the hope that some pics of John Love or Barry Joel actually competing in the car can be found in time for it's completion. 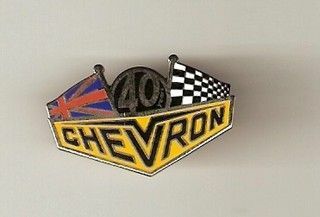 Helen Malkie tells me that at the Chevron 40th celebration at the 2005 Gold Cup at Oulton Park, there was a photo call of all known Chevron B1 & B2 drivers, including Howard Heerey who came over from Australia for it. Helen missed getting a pic of it herself. I know through speaking to John Love that he was there with Barry Joel; does anyone out there have a pic of the assembled drivers? For anyone out there who has been following this thread, I have just this minute been contacted by Helen Malkie at Chevron who let me know that the B2 is now completed and will be making it's debut in the hands of Edward Carden at the Masters meeting at Donington this weekend. I have spoken to John Love and he is unable to make it to the meeting at such short notice, but it is our intention to re-unite him with his old car (and introduce his grandson to it!) in the near future. I intend being at Donington to witness it's return to the track for it's first race since (John thinks) Rufforth in 1975, and will post some pics of the occasion. This thread is about to come full circle! 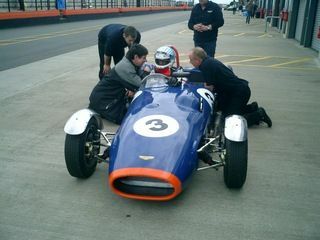 Pics from Donington today show myself with the restored B2, Vin Malkie fettling it, and Ted Carden and the Chevron crew. Ted flew in fro the United States to race the car, and is the brother of B2 pilot, John Carden who was a very well known driver on the club scene in the 60's. Ted qualified the car well against much more powerful machinery for tomorrow morning's 1 hour Sports Racing Masters event.